This famous image shows Schiller (center) in the Bopserwald reciting his play to fellow students of the military academy he was attending at the time. 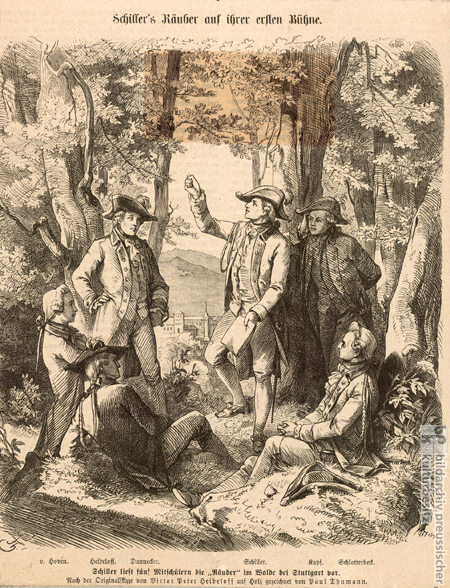 The title reads: “Schiller’s robbers on their first stage.” His friends are (from left to right) Friedrich Wilhelm von Hoven, Victor Heideloff, the sculptor Johann Heinrich Dannecker (1758-1841), Christian Jakob Schlotterbeck, and Franz Joseph Kapf. Stuttgart’s collegiate church is visible in the background. Wood engraving by Paul Friedrich Thumann (1834-1908), after a sketch by Victor Heideloff (1757-1816), undated.